So a few weeks back I had some surgery. Nothing huge (not in the slightest) but I couldn't eat anything with a consistency tougher than baby food for a week and a half. To add a whole bunch of insult to injury, I got my CSA box two days after surgery; it was full of leafy greens, end of summer vegetables and delicious, delicious peaches. Usually this would make me skip all the way home but instead I shed a tear for the vegetables that had to fall into the hands of my friends. Giving up some baby bok choy? I've never been so heartbroken. Pattypan squash? Left me in a funk for days. However, anything that I could roast and puree up I kept. End of the day I was left with a bunch of rainbow carrots, an array of sweet peppers, some tomatillo's and a variety of foods I could bring to that Sunday's BBQ. 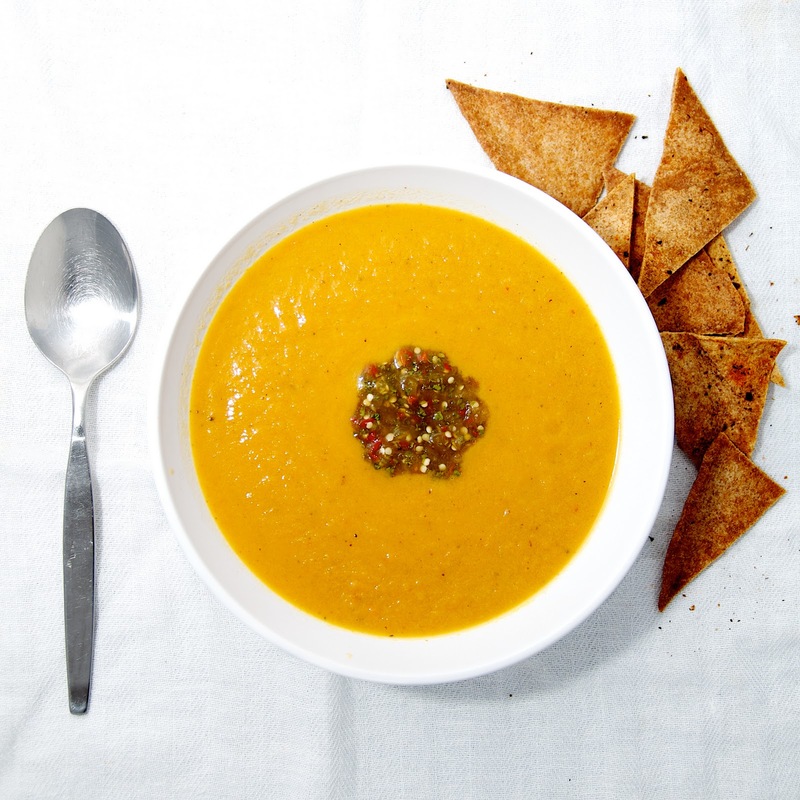 Cue Roasted Pepper Carrot soup with tomatillo salsa. It was easy to make, had a depth of flavor and magically lasted a few days in my fridge. Even though I made this in a moment of desperation, I'm looking forward to making it again. Actually… what did I get in my CSA box again…? Preheat oven to 425°f and line a roasting tray with baking paper. Peel and chop carrots into 1 inch chunks, cut bell peppers into 1 inch squares and place them in the tray. Drizzle over about 2 tablespoons of olive oil, sea salt and freshly cracked black pepper and toss to coat. Bake for about 45 minutes until carrots are golden and tender. Remove from oven and set aside. In a pot over medium high, heat up another 2 tablespoons of olive oil and tip in the chopped onions and garlic. Sauté for about 5 minutes until onions are transparent and starting to brown. Add the spices and stir through. Cook for a minute until fragrant. Add the stock and bring to a simmer. Add the roasted vegetables and simmer for about 5-10 minutes. Puree with am immersion blender until desired consistency is reached and continue to simmer. Check the seasoning and adjust to taste with salt and pepper. Serve soup warm with toast tomatillo salsa. Remove husks from tomatillos and wash well to remove stickiness. Place them on a baking tray and roast in the oven for about 15 minutes or until soft and juices start to seep out. Let cool and slice into smaller pieces. Slice onion into smaller pieces as well. In a food processor, combine the tomatillos, white onion, cilantro, lime and salt and pepper to taste. Blend until partly smooth, partly chunky. Yum! this looks great! It's perfect weather for soup here in Michigan, can you come home and make me some ;) ? And by the way, your photography is wonderful! Laura: I WILL be home for the holiday's (dec 22-jan 3!!) and of course I'll make you some soup ;) And thanks!